Which is more important? Distance is important, but consistency is necessary for control over your shot distance. Practice with Swing Caddie, and you'll find that you have improved confidence, a better swing, and better shots. Practicing the same golf swing over and over again can quickly get boring and tedious. Swing Caddie shows you the carry distance, swing speed, ball speed, and smash factor for each ball and club, and it has three play modes to make every swing interesting and enjoyable. Swing Caddie provides instant visual feedback and stores stats for each club in three modes: Practice Mode, Target Mode, and Random Mode. The better your accuracy, the better your score! Challenge yourself to reach your target distance and score 10/10 every time. As soon as you've chosen your club, you're ready to play! Swing Caddie's remote control lets you adjust your settings without having to take a step. If you have any questions regarding the Voice Caddie Portable Golf Launch Monitor SC100, please give us a call, we would be happy to help you with any questions you may have. 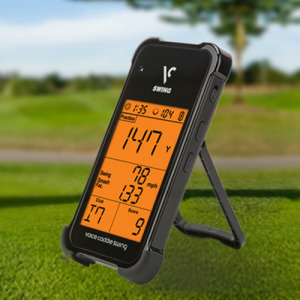 Write an online review on the Voice Caddie Portable Golf Launch Monitor SC100, and share your thoughts with others.